Stox, the blockchain prediction markets platform partners with revolutionary non-profit group, Swachhcoin, to launch a series of predictions on the popular platform. The Swachhcoin Foundation is a non-profit organization whose primary objective is to work extensively to overhaul the waste management sector by acting as a complete technology developer and service provider in this domain. Swachhcoin will make the existing waste management industries as efficient and capable as possible so that they become technologically and otherwise able to tackle the imminent waste management crisis the world faces at this very moment. Apart from working with industries, Swachhcoin will develop an ecosystem where individuals on a mass level are made aware of the possibilities of waste around them so that they understand their roles and responsibility and act accordingly. Swachhcoin aims to revolutionise waste management by creating a token that will be used to provide monetary incentive primarily to the domestic households. The waste processing industry will be at the core of fueling this economy. As an average household generates over 2000 kilograms (nearly 2.2 tons) of waste each year, the project creates the ability to radically change the waste management industry around the world for the better. 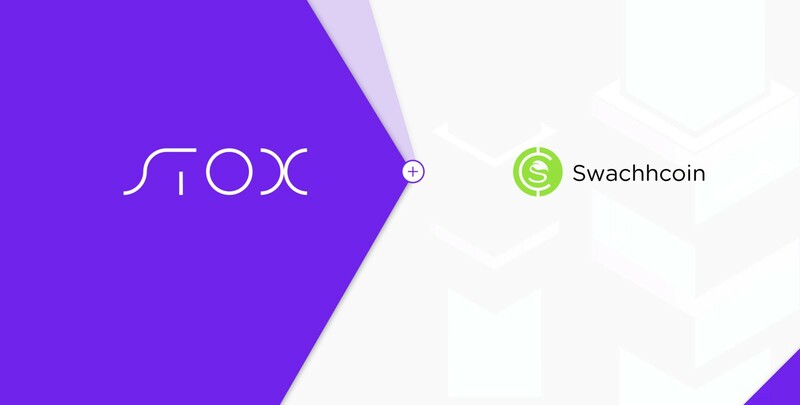 Founder and CEO of Swachhccoin, Aditya Kumar, spoke about the partnership stating, ‘’Partnering with Stox was a natural move for us to promote our token offering. We’re excited to share our technology with the world in order to create a more sustainable environment, while tending to the needs of humankind in a more responsible way. We believe waste processing industries will use a part of the tokens received from the product buyer to award monetary incentive to the domestic households as well as sell the other part on the exchanges to meet their day to day operation and profitability’’. Tolearn more about Swachhcoin and their token generation project, visit Swachhoin.com and for up-to-the-minute updates, follow them onTelegram.